← Guest blogger with a special announcement! I scrap the plan to break camp. We can stay another day. We don’t reach the 14-day limit until tomorrow. If it rains like the forecasters say, well, that’s okay. I could write several more posts about this camp. I have loads of photos and things to write about . . . .
One day a rancher stops by our camp and introduces himself. We stand at the edge of the bluff looking down at his cattle while we talk. Our boondock is inside the 60 square mile area of national forest that defines his ranch. He runs 450 cattle here. “I’ve got cows up in the mountains. These yearlings you see around here . . . I wean them off their mommas and then about 150 of them make their way up into the mountains and find their mommas again.” He shakes his head. He tells me he’s the fourth generation ranching on this land. “It sounds like you have a strong family,” I remark. “Yes, it is strong,” he replies proudly. Another day the crew and I ride in the Perfect Tow Vehicle down a spur road. I park and we get out to walk. We pass two nice sites (one is shown below) and then the road forks. We turn to the right and discover a campsite that is occupied by a man with a van. He’s sitting outside and sees us approaching. “Hello!” I call out with a wave. We introduce ourselves. His name is Bob. While we chat Bridget and Reggie wander around close by. “Oh, no!” I pick him up and hold him, belly up. He has cholla stuck on his back legs! “Do you have needle-nose pliers” I ask. Bob pulls out the cholla spines. Reggie is a brave boy. He doesn’t move or make a sound. 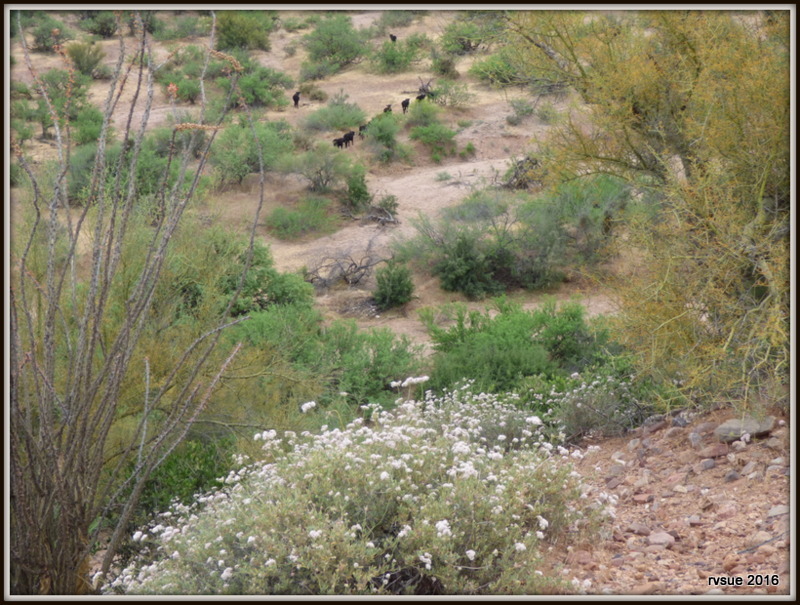 The crew and I enjoy our last full day at our boondock among the cacti in bloom. Every day more blossoms appear. I think we are leaving right before the peak. Even so, I’ve been blessed with more beauty than I ever imagined we’d find on our return to Roosevelt Lake. I watch the familiar black birds riding the thermals near “our” bluff and reflect upon this camp. 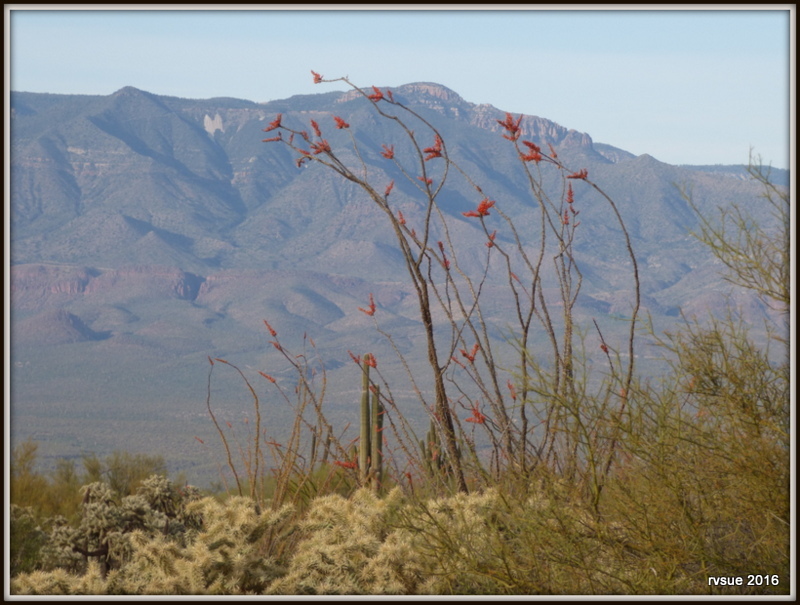 I recall the times I heard a covey of gambrel quail, the road runner who kept himself hidden in the brush, and the “wow birds” who always made me smile. The constantly changing sky, puffy, white, children’s-book clouds, ominous black clouds, the power of a thunderstorm hitting us on this bluff. Also the morning I open the door and startle five deer from the edge of our camp. The sounds of coyotes during the night, of course. 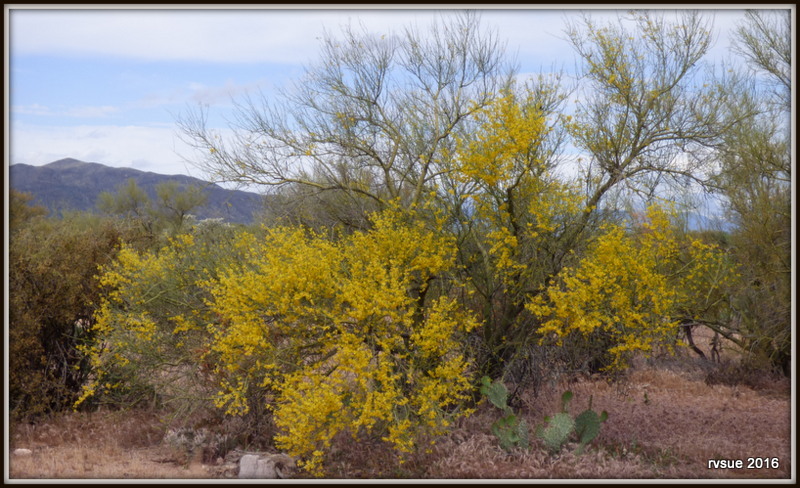 The bees working on the creosote blooms each afternoon. Oh yeah, and the turkey vultures . . . .
We motor over to Windy Hill Campground. I have one more Tonto Pass ($8) left. I hang it from the rear view mirror before throwing our trash in a dumpster, filling up water jugs, and taking a shower at the solar shower house in Coati Loop. Back at camp, I pack up the outdoor room before we go inside for the evening. I’ve already folded up Bridget’s new car and placed it behind the driver’s seat in the PTV. I toss in my camp chair, the doggie beds, and Reggie’s armadillo toy. I pull up the stakes. Lastly I bungee the two patio mats and toss them into the back of the PTV. There. In the morning I’ll secure the inside and hitch up. The coffee is made and the crew’s chicken is ready for their breakfast. We’ll make an early start. THANKS FOR SHOPPING AMAZON FROM MY BLOG! 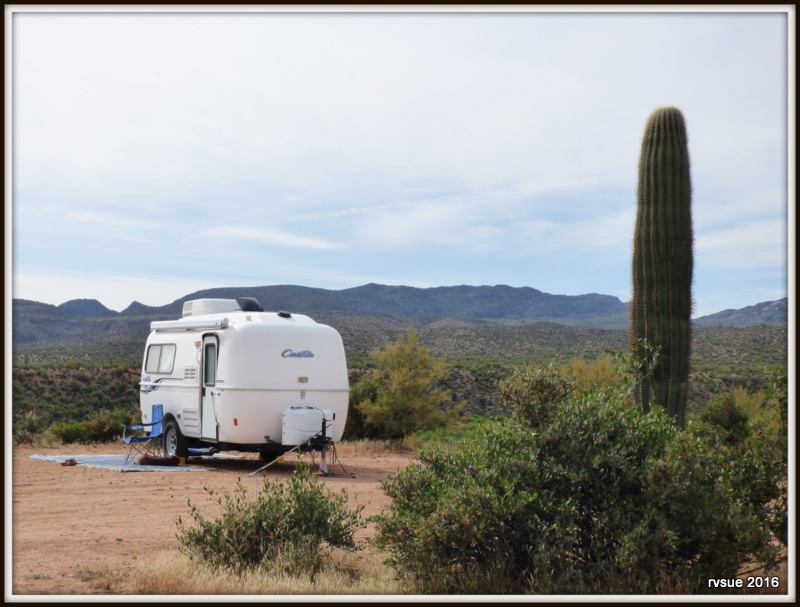 This entry was posted in Arizona and tagged boondocking, cactus, campsites, casita, chihuahua, cholla, National Forest, Roosevelt Lake, RVing, Tonto. Bookmark the permalink. Hi, did I make it? YES, YOU DID! CONGRATULATIONS, DEDRA! Yes very afraid in the desert… Ouch! Glad hes ok.
Yea Dedra… Makes me #2…lol. 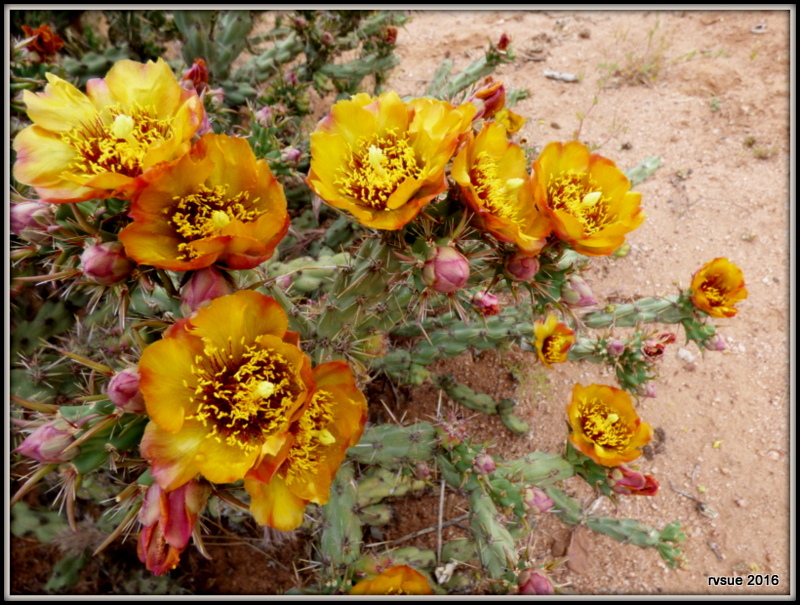 More beautiful pictures of cactus blossoms. I’ll admit to envy right now, even though the weather here is improving. And Calvin R. is in 3rd place! BTW Calvin… Thank you for your note in response to the snark under a recent post. When I deleted his, yours deleted also. I was buoyed by your presence. You’re very welcome. Somebody has to counterbalance trolls. Thank you, Sue, for responding to “Nick” the way you did. I saw it in my email and gave you a fist pump gesture. I hope you felt my good vibe coming your way. Your description of such a perfect, beautiful place brought tears to my eyes – such a wonderful, peaceful life you and the crew live ! The cactus photos reminded me of my Mom (no longer with us) who grew up in the southwest and brought some cactus back to Ohio when she married. I remember they only bloomed once in Ohio, but when they did, I thought they were beautiful. Glad Reggie is okay. He and Bridget have such good lives and look so happy. You are all truly blessed. Yes, I am blessed, Gail, in many ways — you being one of them! Thank you for the touching response to this post. 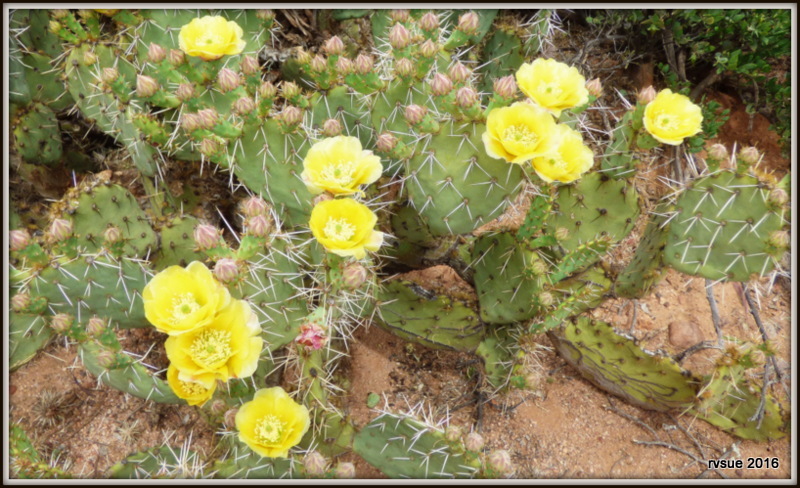 You see your mother in the cactus blossoms which make them even more beautiful. Has Reggie been off lead? If so howhow’s he doing? I’ve been at my sons house about 4 weeks and Corky has been off his tether and stays around because he loves my sons dog. It’s been great seeing him “Free”. But I know when we leave he’ll be back on leash because his best 4 legged friend won’t be with us. We are in the country so thats good. Glad the Reg Man is ok.
Reggie is always on this tether outside. His newest one (yellow) is meant for small dogs like him and it isn’t as visible in photos. How wonderful for Corky to have a playmate and time to be free! Recently I didn’t close the screen door securely and Reggie pushed against it. Away he went! Fortunately it was time for breakfast and he came back. If it had been after breakfast, oh dear…. scary to think of it. The professional training class for our new puppy had us practice an emergency routine for getting a dog to come back for sure and do so very quickly at least 3 times a day. Its called “treat party time”. You call out the dogs name followed by “come” whistles and several loud repetitions of the words “treat party”. The reward is lots and lots of treats, a real party time worth of them. This is done exactly for situations where a dog escapes from someplace without a leash on. KC – thank you for the great advice! My little Rat Terrier hasn’t quite caught on to “Come!” yet, so the treat party would be good. KC – What a great tip – I may have to try that for some of the normal commands though. My Max was older when I adopted and it has really been a struggle with commands. I believe one of the reasons he was turned in to rescue is his original family didn’t train him to do ANYTHING and he ruled the roost. We have established the pecking order but he has been really hard to teach commands, something I expect to a certain extent from older dogs, never trained. ‘Come’ is just something he is very stubborn about. Even though he doesn’t stray far from me, I would never trust him off leash since he doesn’t come. I love this idea and am going to try it. Thank you! Sue, beautiful pictures, very glad that ya’ll had a wonderful time at your Roosevelt boondock. Happy that Reggie Man is alright and HRH Bridget looks very protective of her front porch. 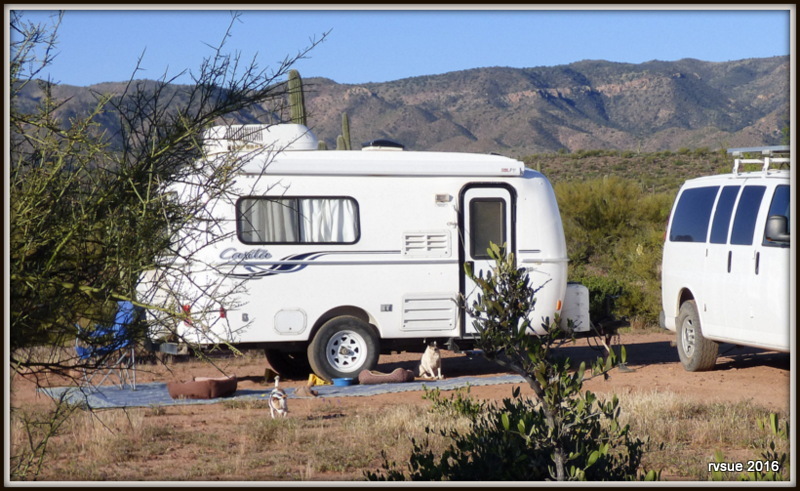 We’ll be waiting for your new adventure in a new boondocking camp. Take care and safe travels. Thank you, Deena. I thought this post would take us to the next camp. I couldn’t move it along… so much I wanted to remember and to share here. As always, an interesting post. Especially since I’m from a family of ranchers this brouht back poignant memories of our lifestyle. The Desert Springtime bursts out blossoms and young critters. Enjoy it all and safe travels. It’s a pleasure for me to learn that a post brings back good memories for a reader. Thanks for letting me know that. Talking with the rancher I couldn’t help but marvel what a wholesome life he and his wife provide for their children. Just 16 ahead of me….Wow! Hi Sue! Your photos are awesome and love hearing your adventures. Miss my on the road life….but maybe someday we will be gypsies again! Until the, you make my heart happy! Thanks, Cathy… I’m glad you are enjoying my blog and its photos. I hope you do return to the gypsy life, if that’s where your happiness is found. Another beautiful campground! Hope you find another just as nice. Poor Reg..do they ever get infections from those thornes? BTW, I ordered a map, an Arizona Benchmark Atlas and a cover for my Samsung from Amazon through your site. I don’t know if the spines make a big enough puncture for infections. They are very fine. So either the rancher is too old to remember, or maybe they don’t count girls? Four kids, a girl and four boys…..or maybe the twins are counted as one, since he can’t tell them apart. Oh, darnit! I’m the one who can’t count! Thanks, Ilse. I fixed it. BTW, we had a cold morning recently after several warm ones. Those blue socks came out of the drawer! I’m sure glad you like them! Thanks, Judy. Better to have more than enough to seek than not enough to keep you interested. 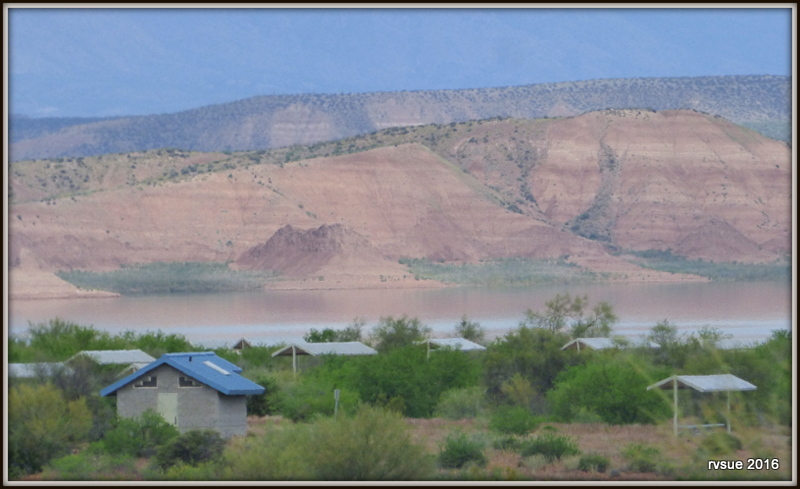 Thank you for sharing more beautiful photos of the Roosevelt Lake camp. Those cacti are so pretty! The photo where Reggie spotted the cow made me chuckle! It looks like he did a double take – yikes! What is that?! 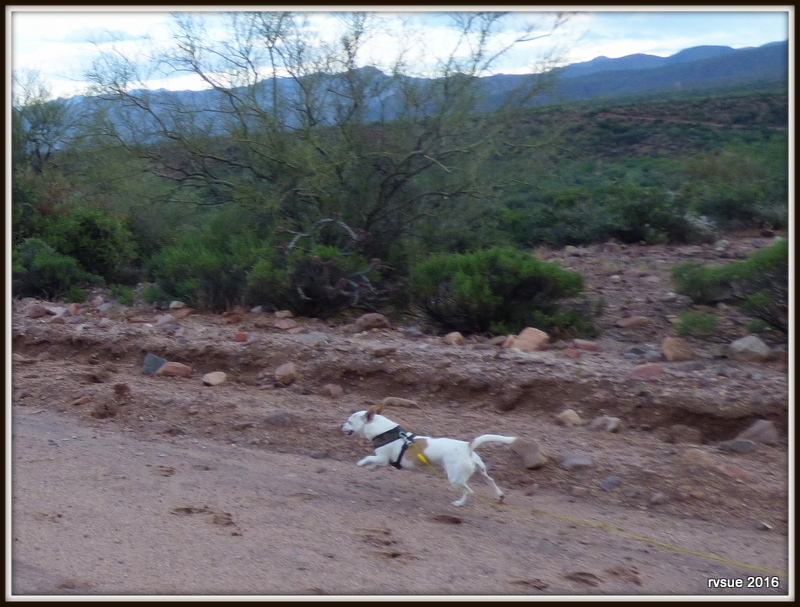 And the cute photo of him running with joy…free at last from that evil cholla! Our boy has earned his stripes! Miss Bridget is sitting pretty, keeping a close eye on Reggie, and willing you to put that camera away! LOL! 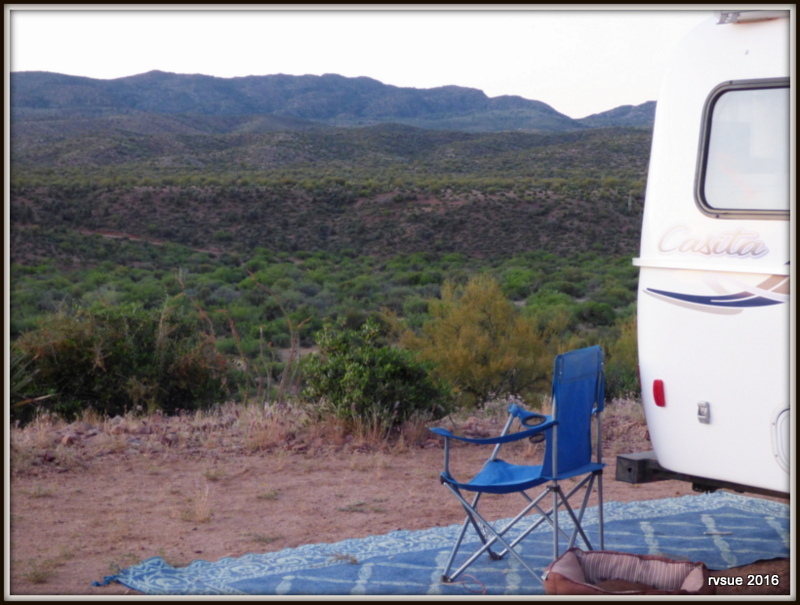 I hope you found a site just as nice….maybe you can double back for another stay if the weather cooperates. You’re welcome, Denise, and thank you for another cheerful comment. I like that photo, too, of Reggie putting on the brakes when he saw that cow. More Reggie-with-cows photos in the next post! Sue you are very fortunate to have met a rancher and a real cowboy, my life’s been enriched by knowing a few ranchers and farmers back in Colorado. There’s not many of them left and societal pressures, and a government that discourages individualism, and personal responsibility are slowly removing people from the land, and the land from the people. the Man you met won’t bend and he won’t break, but sooner or later his kids or his grand kids will and that ranch will become another state Park or housing development and people will forget that men like him ever existed. Gee, such a dismal outlook. No doubt there is history to back up what you predict. I hope what you say doesn’t occur in this particular family. I got the impression that the younger generation — his children — love their ranch and their lifestyle. Yes, I was fortunate to meet him. Yeah your right that did kind of sound like an ” end of the world” rant after I reread it. I think reading about the rancher that you talked to brought back some memories of folks I know that were having a tough time hanging on to the ranch. And saw not only the land that their grandfather was born on slipping away, but also that the way of life that few people appreciated or understood was being blamed for all that is wrong in this country. You know if you hadn’t written about that rancher in such a heartfelt way I probably wouldn’t have been moved to write what I did. So my rant was obviously your fault. 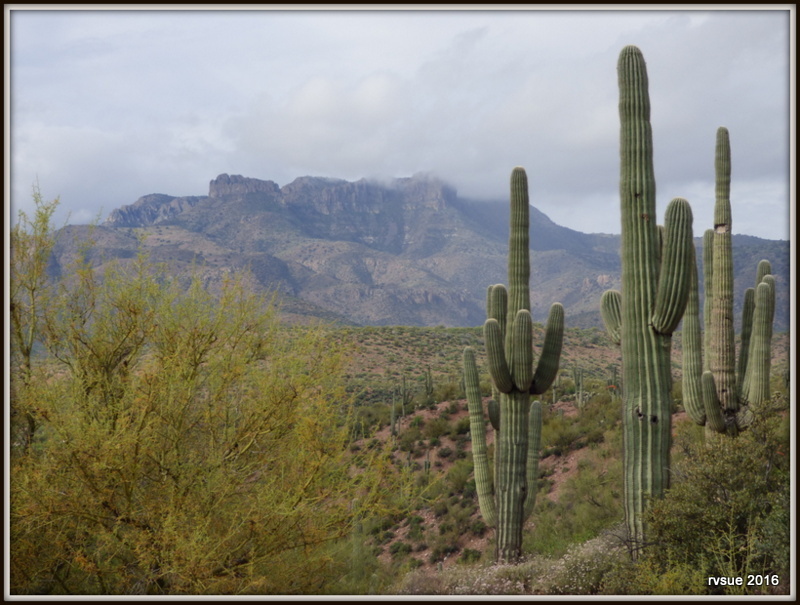 Sue, I am so enjoying your photos of the desert – the saguaros, Reggie and the cow are hilarious. And then the last close up of the BLT really struck me. It is a tiny little thing! To be able to live with what can be carried in a 17′ TT and van one has to really get down to the essence of living. The consumerism of our society has to be left behind. But then the real joy of living life can be experienced. That’s pretty amazing. Love your comment. You sum up very well the reward of living simply. Recently I thought about the BLT, how small it is and how we adjusted to much less living space when we transitioned from a four bedroom house to 17 feet (including the trailer tongue!). Each one of those four bedrooms had more space than the interior of the BLT. The BLT seemed small for about a day. After that, she seemed to grow. Now the BLT doesn’t seem small to me at all! Sue, Just wanted to let you know I picked up 2 Optima yellow tops last week, and so far they are doing super!! Will be hitting the full time road in early August, as my 94 y.o. mother recently passed, and she was my reason for staying put the last 3 years….will keep watch on the road for the PTV, will surely cross paths one day, but fear not: I know your rule!! Safe Travels…..
You have my condolences on the loss of your mother. At 94 years she probably was ready for passage and for seeing those who went before her. Launching in early August — just like we did! Buying two Optima batteries was a smart move. We have three of them now. The first two are about 4.5 years old and they’re charging up and holding a charge as well as when they were new. Best wishes as you finish up preparations for the transition to a new lifestyle! BTW, I hope you will keep in touch. When you do, please put a state abbreviation or a tag onto your name so we can recognize you. Thanks. Nice and funny story about the rancher, Sue!! Cows are something…and smarter than usually folks think they are. And what a nice thing to find a strong family…5 kids? Why would you need neighbors? I hope those bonds will remain strong after his kids leave home!! That is the hardest part I think… We had the tightest bond ever with one kid of ours in particular…but then came marriage…wowee, things change quick! I have often told friends I think I raised my kids for other families…I am glad they are welcome there, but we wish they had more to do with us. Oh well…friends come in nicely too!! I’m sorry you are among the legions of parents who feel brushed aside by their adult children. I hope somehow you are relieved of the hurt. It’s very difficult to raise a strong family these days among the many negative influences. The ranch lifestyle seems idyllic. Those kids probably know what work is and that self esteem comes from what you accomplish, not from what someone tells you. Yea, we are ok…one adjusts to things as they are over time. And we do have friends…enough that also are in similar situations. Wonder if the next generation realizes how SIMILAR a lot of them seem to be? Our situation is not a total cutoff as some are in, but a very distant thing. Hard for me to understand really because I considered my wonderful mom my best friend. I guess they must think I am not that kind of parent? Oh well…life is short. We do all we can to enjoy each day and many days are joyful thankfully. We generally work very hard when we are with our offspring…working at fixing things, childcare, etc. For that we have worth I guess. Some days I am glad to be OLD though and looking forward to the life to come yet. And yet I have many projects for many different things (some charity) I hope to get made in the next year or so…I do not believe in being bored!! I love this post. Pics are wonderful. Loved hearing about the rancher and his 5 kids.im so glad you had such a nice boondocks, and have lingered a little longer in AZ. I don’t know why, but I always feel like I miss you when you head north for the summer. Tomorrow is my next heart procedure, and I will be discharged Saturday. That’s exciting! I just hope I can get stronger now that my heart allegedly works better. Can’t tell yet. Now I will be saving to purchase a van; that is my next dream. A van I can camp in. Then I can travel all summer. But first getting stronger and taking care of my finances. Lots to do. I know you are already at a new camp. Can’t wait to see it. Thinking of you today, DG. Love your forward thinking, Ginger! And it’s good thinking, too… a camper van is a wonderful plan for summer travel. Then when cold weather is on its way, you return to your cozy abode in Arizona. Sweet. Goals and plans are a good thing, Ginger! Glad you think you will soon be past all of this and hope the recovery continues quickly. My aunt who had triple bypass last year feels she is not up to where she was, but generally feels ok…and says she just needs extra rest! I hope yours goes as well too!! Prayers for you DG. Sincerely hope all went well. DG – thinking of you and hoping all went well yesterday. Absolutely glorious Sue….know wonder you wanted to linger. Beautiful scenery and nature all around you………..amazing. Sounds like a pretty perfect week (other than the taxes that is.) Love the cacti photos. Oh, poor little Reggie, but it sounds like he took it like the little tough guy he is. Watch your sister Reg, she’ll show you how to avoid those damn Chollas. But judging by that next shot he’s still flying. Are you thinking of heading north now? 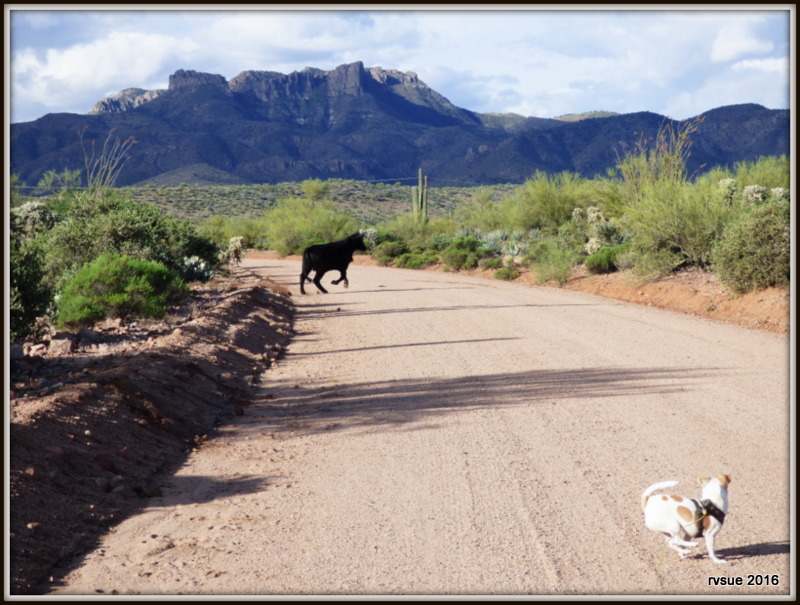 Bridget is a master at avoiding cholla. I don’t think she’s ever picked up any. Rarely does she pick up anything on her pads. Quite an incredible feat given the places we go. Yes, I’m thinking of heading north, a plan is beginning to form. As for “now”… well, not quite yet. We’re stalling for a week or two in a warm area before heading up into mountains. Oh yippee…the mts…will be reading a lot during that part of your trip!! Beautiful flower photos. One of these days we are going to make it out to the desert and see it for ourselves, but in the meantime, you are doing a most excellent job of showing this beautiful area of the US. I’ve subscribed to Farm & Ranch in the past and always loved reading it from cover to cover. The family stories and the daily diaries are fascinating to me. Last but not least, I really liked the ending of your post, the story of how you got the home on wheels ready to move on for the next adventure. That bit of practical advice made it more relateable and I liked the “…coffee is made…” part. Coffee just always makes everything better. Meant to finish the reference to “Farm & Ranch” by saying that the rancher that you met made me think of that magazine’s contents and how close-knit their featured families also seemed to be. It’s interesting to me what part of the post you liked the best — those practical details that are easy to leave out of a post. Thanks for the feedback and for the compliment on the post and photos. I hope you do make it out here to enjoy the west. Thanks, eliza. I could’ve been a great teacher — I had my moments — but overall great teaching wasn’t allowed. Enough about that! Your comment helps me understand the elements of a post that make it “work” for readers. I hope you are enjoying the weekend! I envy that rancher and his wife and kids. That’s how I wanted to grow up – on a farm or ranch, no neighbors, animals every day. Lucky kids! I agree, Jan. An idyllic place in which to grow up and with both parents invested in home and family. Too bad everyone doesn’t have that! Thanks so much for sharing through your blog. The pictures are beautiful. I loved hearing about the rancher and his family. Reggieman earned his stripes, such a tough little guy. I can see the pure joy in him as he runs. I can definitely see why it was difficult to leave this campsite. Thanks again for bringing the desert to life, I lived in Tucson for a year and I miss it so. Anyway, I am off to work, I hope your day is a delight. I hope your workday progresses smoothly. I’m happy you started your day with me and my crew! Also, you have inspired me. I’m pushing 50 and I am starting to make plans for my own little home on wheels. Thanks again! You’re welcome and Yippee for you, Gingerita! Make your plans and make ’em happen! great post today young lady………was good to hear Reggie was a man in having surgery on his back legs….my Pookie woulda gone crazy…..
was also glad to hear the ranchers kids wanting to ride horses instead of cars….Im sure those kids dont have any of those TV playthings that keeps kids tied to a TV for hours on end……. if ever there was Heaven on earth your there…..thanks for the great blog…. You’re welcome, chuck. Thanks for the compliment on the blog. Reggie is a take-charge kind of guy, except when it comes to pain. He knows it’s better to wait for help. When we’re out walking and he picks up a burr in his paw, he stops, lifts the paw, and waits for me to “fix it.” Spike used to do the same thing. As for Bridget, she doesn’t step into trouble in the first place! Hi Chuck…I’m a neighbor or yours, about 6 miles to the west of Todd Mission.I’m about ready to set out full timing. Do you know of anyone local that could set me up with an antenna set up such as Sue has? What a lovely, peaceful post. It really encompasses the freedom of your lifestyle. Mix of natural beauty, friendly conversation, and a bit of practical life. Always look forward to one of your posts. Thanks, Applegirl. And I look forward to hearing from you. . . .
Hey RVSue & Crew… The pics are beautiful love all of them! 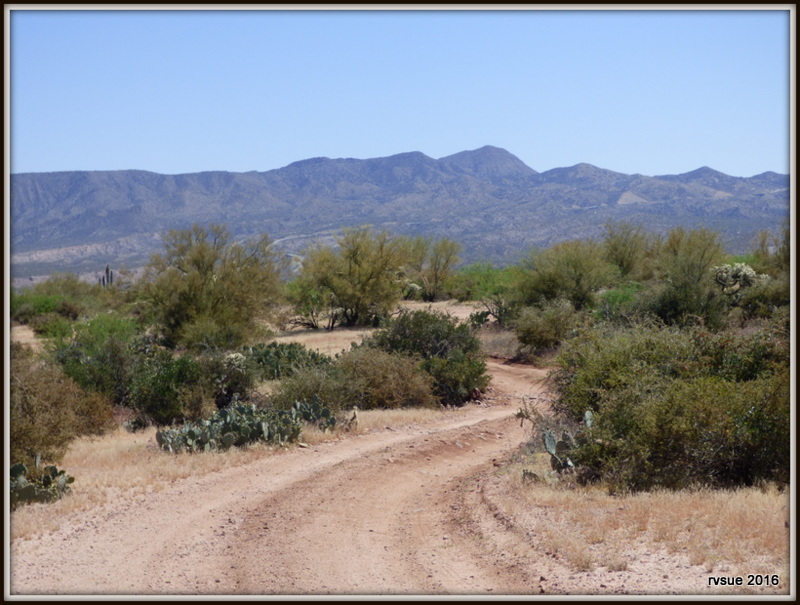 Do you have a map that shows you the spur roads and boondocking areas? I would love to stay there sometime. Take care and keep roaming!!! The Benchmark maps show forest roads (not all, but plenty of them) — dirt roads, those for 4wd only, spur roads. In the case of this boondock, I relied more on searching by driving around, rather than studying a map or going online. It’s fun to do that — just explore! Sue … I’ve been reading your blog since the start. Well actually I started reading it the first month you hit the road and went back to read all the post to catch up and have remained caught up since. So I like many of your readers have followed you for a long time. The reason I am saying all of this … as I was reading your post and looking at your photos, counting subject content … I was thinking to myself, “this is the best post she has ever written”. Thanks for letting us follow your travels, from all parts of the world. You’re welcome, Steve. You are one of the few who can claim long-time readership from the beginning. Thank you for your loyalty to my blog! What a treat to check for a new post and find one first thing this morning! Your photos always go so perfectly with the essay. I especially like the sentence, “Congratulations, Reggie Man. It’s official. You are now a full-fledged desert boondocker!” followed by the photo of him in a full run, as if he is celebrating the fact! Your little loved ones are so blessed to have been found by you. They are living a very full life for sure. That photo is one in a series of “zoomies” I took of Reggie at this camp. The great thing about dogs — something we can learn from them — is they don’t fret about what’s done. When it’s over, it really is over with a dog. I hope you are having a good morning! Thank you for asking, Sue. I am! It’s Friday and can’t get any better than this! I hope you too have a great weekend. Your exceptionally fine boondock makes for an exceptionally fine blog post. You are such a great inspiration. I hope that time will fly as we approach our last 5 months of waiting to be on the road. What a great photo of Reggie floating mid-stride. Thank you, katydid, for the uplifting comment. I think you will find that time speeds up the closer you come to your launch day. Exciting times for you! 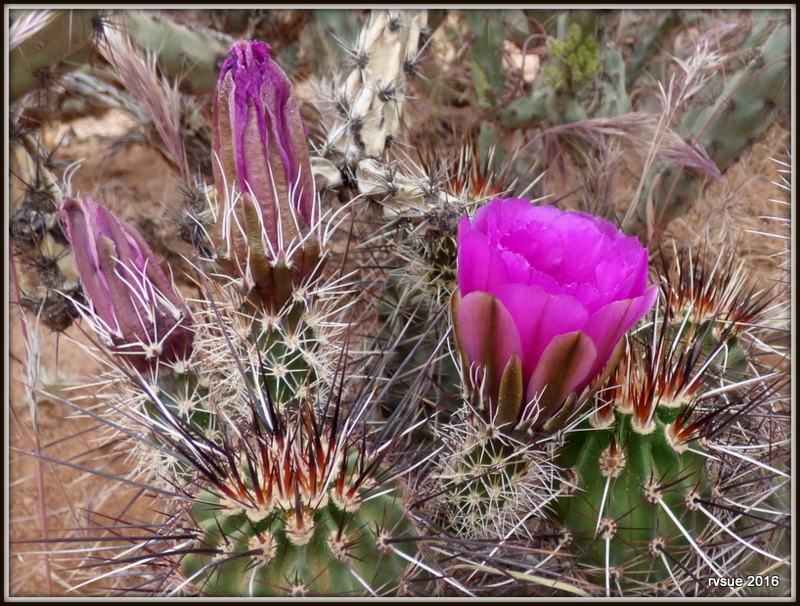 Still loving the desert flower photos! So amazing and foreign to me. One day I hope to see them. Oh Reggie looks so happy in the running shot of him, I smiled to myself. What a good doggy life, even as he learns about the cholla thorns. Can’t wait to see your next camp. Take Care Sue and Crew! 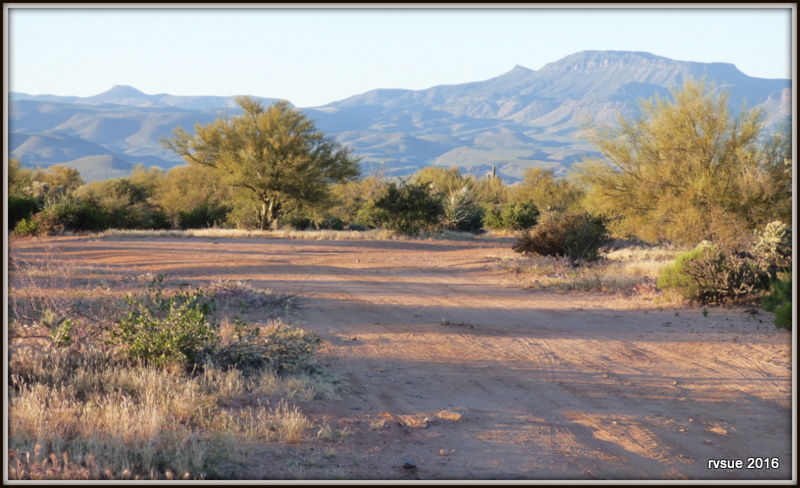 The desert is “amazing and foreign” to me, too… at least it was when we first came out West, and it still enchants me. I’ve come to love it in its many forms. I hope you do see and experience the desert, Diane. Good Morning Sue, I so totally agree with what Steve said in comment above. The last post from you and this one are two of your best in quite a long time. Trials and tribulations of the past behind you, your writing is starting to hit its stride. The pictures are equally impressive. You humor has always brought us to return each post, but the bigger meaning of your life is filtering through nicely, and as you pass through this time in your life, it enriches ours with your kindness and wisdom you impart to your blogorinos. We are glad to be in this with you everyday. Enjoy this day, it will be another special one I am sure. Good morning, Shirlene, and thank you for another thoughtful, encouraging comment. You are very sweet. I try to include in my collection of posts the feelings and moods that affect my experiences. Cheery-cheery all the time, I’m-so-amazing, my life is perfect…. Oh, that gets old fast. At least for me it does. You say I’m kind and wise… well, probably not more than most people, but thank you anyway. I’m glad you are “in this” with us everyday! Good morning, These photos are beautiful. I can’t get enough of the gorgeous cactus blooms. Poor little Reggie and the Cholla. I haven’t read the comments yet, but will do that later on today. Need to get to work now. Hope you are enjoying your new camp. Thank you… I hope you have a good day at work! I have what I know may be an extremely dumb question. But I’ll never know unless I ask. I make my dogs’ “soft food” myself. Won’t go into what I put in it because that is not what my question is about. I use a crock pot for most of the process. If I have solar power, is it connected to the house battery all the time? If so, could I have my “secured” crock pot plugged in during the day as we motor down the road without damaging the system? I know that anything that creates heat takes more power. If I had to do with less power that night, I’d be OK with that. I’d plan for it. But I didn’t know if it would work. I have so much to learn but I look forward to it. Thank you in advance for any help you or the readers can provide. Good morning, MB . . .
Wow! Thanks for the information Elaine! Hi MB, I hope it’s ok if I respond to the question you are asking Sue. The outlet in your RV more than likely is connected to your solar system bank, but some aren’t so you need to know for sure if it is. If your crock pot will turn on, plugged into that outlet, without the generator running, then more than likely it is. With it plugged in you need to check your solar panel for the draw or pull on power. If it’s minimal then it’s ok to run it. If not, then you have to have it running when your generator is running. More than likely it’ll be ok. We have solar power and we can run our satellite, TV, and my husband can be working on his laptop all on solar, at the same time. We can run everything on solar when boondocked, but the fridge, AC, MW, and vacuum. We run our fridge while on the road on the solar and as soon as we get where we’re going, we flip the switch to have it run on propane. See, en route, the solar charges and the truck battery also charges it so DH (darling husband) doesn’t worry about it. Oh, I belong to RV.net and a lot post up there that they run their crock pots while driving down the road, nestled in the sink. Not sure what else they put around it to keep it from jostling around. Hope this helps. Hello again, MB…. The day got a way from me! I really don’t know much about using a crockpot on 12volt power. I’ve been told it will work if you heat every first, put it in the crockpot, and leave it on “low” setting. Looks like you received good information from fellow blogorinos…. Google “watt meter” on RvSue’s Amazon link to read about a very handy device for accurately telling how much power any 120 volt appliance will draw. The label on the appliance will only tell the maximum draw. Your inverter should be rated for twice your largest load. What a great camp. I’m going back to look at the pictures again and imagine. Such views! Thanks for taking us all there with you. And glad little Reggie survived his first brush with those nasty cactus quills. You’re welcome, Dawn. I love the image of someone looking at my photos again in order to imagine. I hope they take you on a magical mystery tour! “I could write several more posts about this camp. I have loads of photos and things to write about…” -I imagine so, what a beautiful place and perfect time for you to have been there! As much as I’d enjoy the extra posts I’m glad instead that you use all the hours needed to do that engaged with living ,with the crew and with what’s near you at the moment. 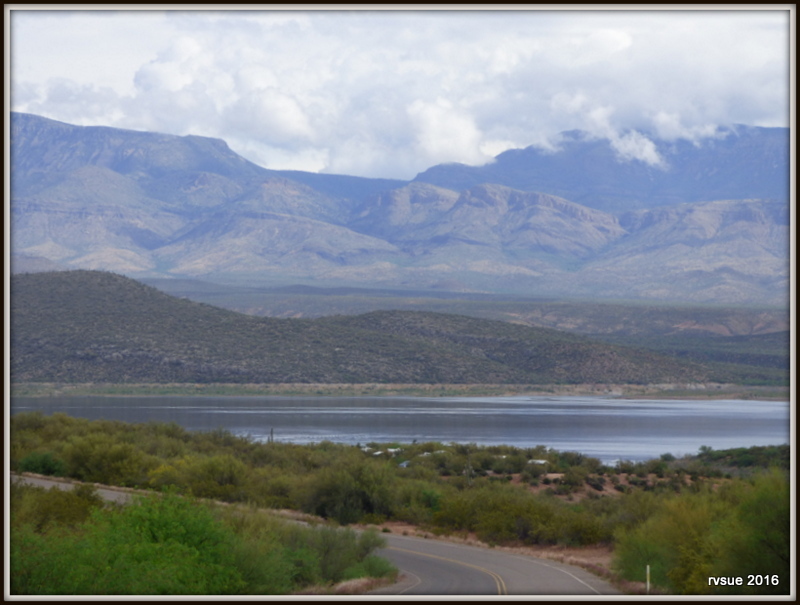 Wonderful photos, Sue, I especially like the ones of the cactus with purple flowers and Roosevelt Lake with the clouds drifting along the mountain top. The one with the BLT, Bridget and Reggie in it has me all sighs of contentment and smiles as I type. I’m so happy that you can take your sweet home and precious companions wherever you go. One might think by now the concept of that would have become something to be taken for granted after reading your blog for as long as I have been yet it’s still a source of continual delight to me, and must be for you, too. Does having the new car for Bridget continue to alter your routines and lives ? Bridget’s car makes it possible for the three of us to venture further from camp on twice-daily walks. I think the greatest advantage is the change in Bridget. When I put Reggie in his suit, don my hat and pick up my camera, instead of slumping into the bedcovers, Bridget perks up and is eager to go. I love that! Anyone who has suffered with arthritis or any sort of chronic pain knows how easily one can slip into a “why bother” state of mind. The car restores fun into Bridget’s day. How great to have Bridget eager to go and having fun, and how healthy-for you, too, Sue. I know what a difference that makes in how you feel day and night, I so-o happy it’s working out this well for all three of your sakes. Recently I’ve thought about how being a single parent, of our own offspring or of an animal family member, is thought of by those with a spouse or partner to share that. They tend to think of in terms of companionship, and then having responsibilities divided so lessened. To me the energy drain/weight of concern rather than knowing the one(s) in only my charge were able to enjoy life was an more of an issue , and one seldom understood by someone that hadn’t had a similar experience. I’m not sure that I’m expressing what I mean understandably or if your experience is similar in a way that you are aware of. I do believe, in any case, that Bridget being made happier is rejuvenating for you, as are the extra exercise and freedom to stay away from home picnicking or exploring, etc. I understand what you wrote about the “energy drain” and “weight of concern.” You experienced that when the bodies of your two beloved dogs were failing. And yes, my experience was similar with Spike and now with Bridget. Any sign that our efforts are improving their time left with us is a tremendous boost to the spirit. How do I see the mighty PTV? Remember the photo I took of the PTV smiling after her steering wheel cable was repaired, when she was my commuter vehicle? In cartoon form the PTV is smiling broadly with a powerful, can-do attitude. Her front quarter panels bulge like straining muscles and her tires grip the ground as she tows the BLT and carries us over rocky roads, across washes and up mountains. Reggie, Bridget and I are inside, our eyes wide with excitement while we cheer her onward! My procedure went well and I am out of afib! You have no idea how good it feels to be back in normal heart rhythm!! Yippee!! Yes I do! Good for you. Now get the heck home. The best of news, D.G.! I’m thinking that we all keep watch for your updates. Along with Sue’s always so interesting news and the fact that spring is in it’s full bloom and glory in the south…life is so precious and good. Great news DeGin! Put one foot in front of the other…..girlfriend! Wonderful to hear that. Now to go home. That’s fantastic DG. I imagine you perking up and moving into a summer of adventure just like the tulips in my yard. Breaking through the last remnants of a long winter and announcing to the world that the cycle shall renew again. The life of a boondocker holds soooo much magic!!!!! I can so relate to this post. The great feeling about your camp is what I just experienced on the Nahatlatch River last week. Thanks for bringing it all back to me. Though a very different place, the same joy. I’m happy for you, Elaine, that you had a joyful experience with the river. River camps are wonderful. Maybe we will camp by the Nahatlatch sometime. Reggie looks like is flying! Glad he’s OK and that he was such a brave little guy. Thank you, Marcia…. Reggie holds a lot of toughness in his little 9-pound body. Yet he can turn into a baby when he realizes he needs help or if something scares him. He let me hold him belly up and also let Bob come at him with pliers. Sue, what a lovely post! But, I still think you’re BEST one was the one where you gave that hummingbird feeder a lesson-and ran over it! I was on the floor with that one! But, this post is vastly different…very reflective. I do love it. I got my hubby into a dialogue about what we wanted to do when he retires in 4 years. We both want to travel, but don’t know if we should hang on to the house or not. Decisions, decisions…hopefully, all will come out right. Hope you find a great camp! That’s great! It’s not too early for you two to create a dream for retirement and to plan for it. The decision regarding the house is a biggie. Some folks keep the house because they like having a place where they belong, among other reasons. Others, like me, don’t keep the house because we don’t want a place where we belong. We want to belong everywhere our wheels take us! Think it through and talk it out until you know what is best for you and your situation. Good luck! Hi, Sue and crew – No wonder you decided to stay — what a beautiful place you found. Your pictures are wonderful. The views and the story are all so inspiring. You know, if it weren’t for you and your very nice blog, I would not have had the confidence to order my Casita and live full-time in it. Thank you. August 1st is the planned pick I’ll date. I just traded in my 4 cylinder vehicle for one that can tow. I feel better knowing I am ticking things off my ‘to do’ list. Happy trails, and thank you so much. Do you have a destination in mind come Aug.? It must feel great to be ticking things off your to do list. I’m looking at places I want to head out to as soon as I can. Time will tell when that will happen. You’re making it happen and I’m very happy for you, Pamela! Hi Pamela..I am so excited for you! Seems there are several of us newbies. BTW I live 50 miles NW of Houston. Will be picking up my trailer in a couple of weeks, but will be hanging out till probably mid June, and then who knows what direction I’ll be headed. Seems like somewhere cool might be nice by then. Like you, I’m not sure I would be doing this if it were not for Sue and the other Blogerinos. Good thing the man with the needle nose pliers were available. Reggie man must’ve been a happy camper. I am thoroughly enjoying your photos. Who doesn’t love the striking colors adorning a cactus. Thank you and enjoy your travels to the north or wherever your heart sends you. Safe travels. Yes, it was fortunate the man had needle nose pliers. Of course, if we hadn’t stopped to visit with the man, I would’ve been watching Reggie instead of gabbing. It was a spur-of-the-moment decision to park the PTV and go walking and I was unprepared. Sue, may I have your permission to copy/save your picture of the cactus with the pink flower tops? I would like to one day watercolor it. I promise it will only be used as a visual reference for detail it is beautiful. Ooh, yes, go ahead and paint it in watercolors, Rosalyn. That will be lovely…. Only if you share your watercolor. Am just now exploring that media. But very fun for 1st timer artist! Cholla!!!! The desert curse. I had one in my front yard when I bought this house, guess how long it took to have my yard guys remove that nasty thing? I hope Reggie remembers where he got that and stays far from it in the future. Your photos are all excellent, but then I have come to expect that from you. You are my daily smile Missy. I’m honored to be your “daily smile, ” Jim. Your mention of cholla reminded me of a house I saw in the desert somewhere. It was off by itself, no grass, of course, just dirt. 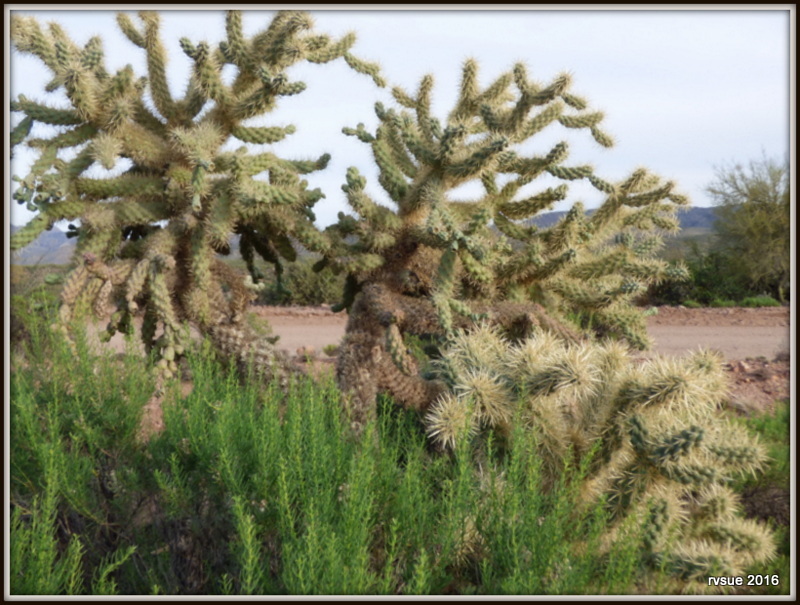 The “yard” was full of cholla! All around the house! Craziest thing I’ve ever seen…. 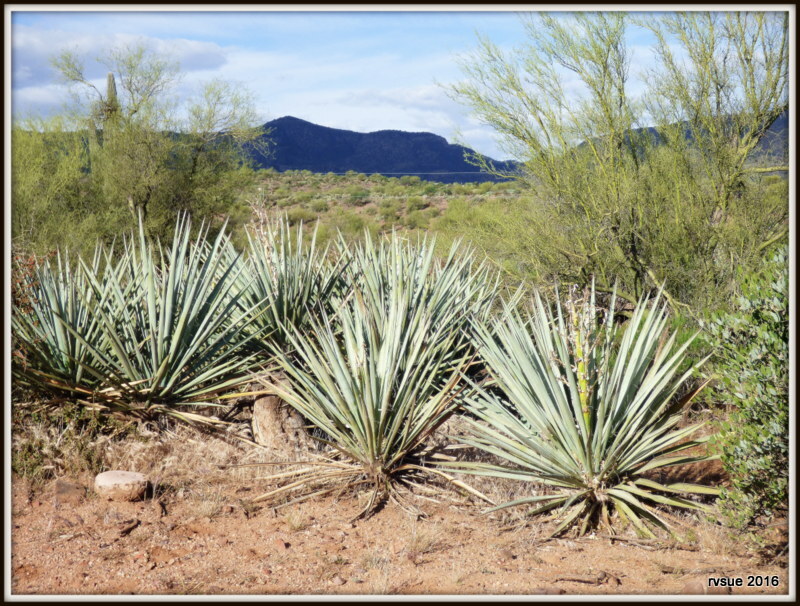 Reggie avoids cholla. You know how those things are. Not always easy to spot and that day was after the fierce storm. 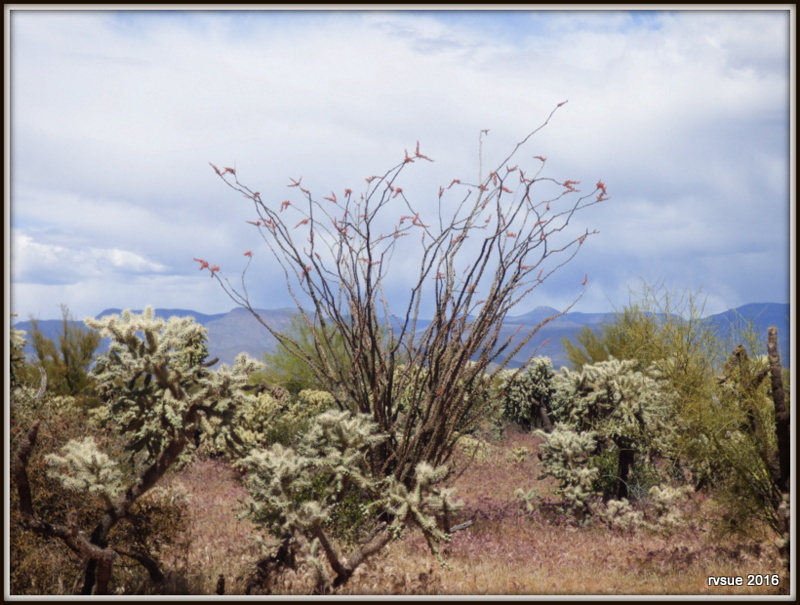 Prior to the storm the cholla pieces weren’t strewn all over the place. Reggie’s smart. One ant bite and now he gives ant hills wide berth. no one breaks into a house with cholla’s under the windows. Photos are great such colorful blooming flowers! Love the photo of Reg man running like the wind! And Ms Bridgee babee is not under the BLT! life is good! Do you carry a fanny pack? For your keys, poop bag, ID etc? I have several Swiss Army type knives….that have tweezers, pliers and the like…..some are really small and handy. If you would like one….I’ll put one aside for you. You never know when you’ll have a McGyver moment. I did have a fanny pack and I gave it to Dale, the guy traveling across Arizona on a bicycle. He needed it more than me. I didn’t really care for wearing it anyway. Thanks for the kind offer of a Swiss army type knife. We should do okay in the future. The secret is remembering to carry the stuff …. Bridget’s new car with its basket will help. That’s right….I had forgotten you gave it to Dale. I had forgotten that. I wonder how Dale is…. Love these pics. So beautiful is Sue and her crew. Have a great weekend. Thank you, Sandi. You have a great weekend, too, wherever you are! IT LIVES !! sort of. It seems that the Old Fat Man is going to return, now I’m beginning to wonder if it was all a publicity stunt. Nooo, he wouldn’t do that……. or would he? I doubt very much it was a stunt. Life happens. Boondocking or having tea and crumpets with the Queen of England? That is the question! Hah. Boondock like you mean it! What the heck is a crumpet anyway? A crumpet is similar to an English muffin but different. A crumpet is actually more like a thick, holey pancake. You do not split a crumpet open. You just pile….cream cheese, peanut butter, butter and jam….on top and eat it. Yummy good. Without googling it…..ummmm some kind of high end pastry? I guess they’re similar to scones. Scones can be tasty. If you let them go stale, they double as pretty good wheel chocks. So stale Scones as wheel chocks work better than hummingbird feeders? ? Glad you’re having a good evening! I was Wrong……it’s an ENGLISH muffin! WHAT???? Yuck who drinks tea with their English muffin? I’m sorry it isn’t working. Maybe your browser is old? I’ve heard that can cause this problem. In the meantime a bookmark or desktop shortcut may be convenient. Heart rate 66 this morning! Yippee!! I’m normal again! Thanks everyone! They persuaded me to stay till tomorrow just to be cautious but tomorrow I’m out of here! Whoopee! Very HAPPY for you, my virtual friend. Good morning and thank you, Denise and Gracie pup! A weekend at home with Gracie, doing a few chores, cooking a favorite meal…. That does sound wonderful. Excitement is good in small doses. Contentment has more value and you seem to have that. I’m happy for you and Gracie. Beautiful, beautiful photos! And cattle too! My kind of post. Have a wonderful time at Lake Mead, Jodee! Sue, I found info on Reggie’s breeding. Very interesting. He apparently is one of the dogs with the longest lives, so it’s a good thing you guys hit it off so well.